Tires specialist Continental is reminding drivers that, even in summer, it is important to allow for longer braking distances when driving on wet roads – particularly after a long spell of dry weather. Tests at Continental’s Contidrom Test Center near Hanover, Germany, have shown that on wet roads, stopping distances from 100 km/h increase by approximately 12 meters. At the point where a car braking on a dry asphalt surface has already stopped, the same car braking on a wet surface will still be traveling at a speed of 50 km/h. In addition to longer braking distances, further risk factors when driving in rain or drizzle include impaired visibility, which means that drivers have less time than normal to react to unexpected obstacles. The tire manufacturer advises drivers to reduce their speed and take extra care under such conditions. 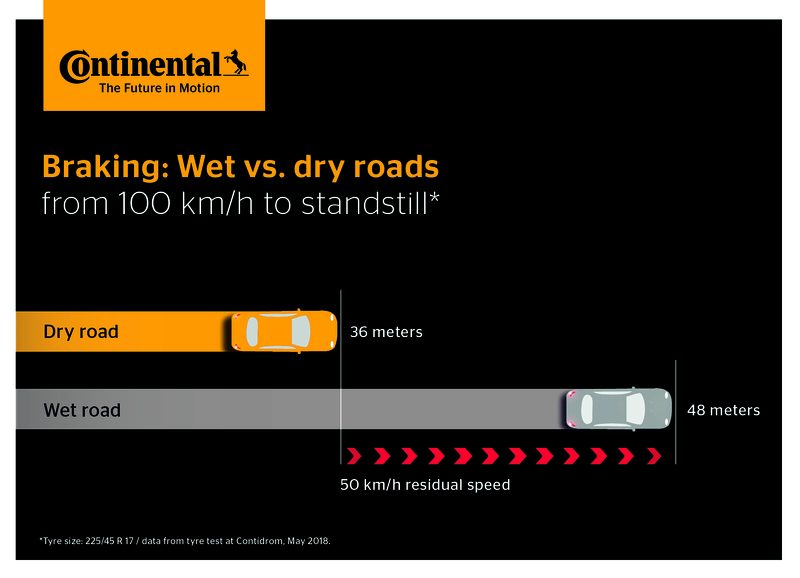 The braking distances from 100 km/h measured by Continental on dry and wet roads are 36 meters and 48 meters respectively. These apply to brand-new tires with maximum tread depth. In practice, experience shows that braking distances in the wet increase as tread depth decreases. The formation of a slippery film on the road surface, particularly after long dry spells, makes it even more difficult to predict how long the vehicle will actually take to stop. To stay safe in the wet, motorists are advised to reduce their speed and maintain sufficient distance from vehicles in front.